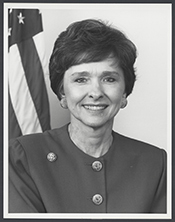 Sue Myrick, an advertising executive and former Mayor of Charlotte, won election to the U.S. House of Representatives in 1994 as part of the “Republican Revolution.” One of the leaders of the large GOP freshman class in the 104th Congress (1995–1997), Representative Myrick acted as a liaison between the leadership and a core group of conservatives and earned a powerful position on the Rules Committee. A fiscal and social conservative throughout her career, Myrick once observed, “I’ve never been called a moderate before in my life. I am a strong conservative.”1 Yet her personal battle with breast cancer led her to cross party lines, becoming one of the chief legislative proponents of bipartisan programs to combat the disease. Her experience with advertising meant that Myrick was a frequent spokesperson for the conservative wing of her party. As one of two freshman lawmakers who acted as liaisons for her large freshman class, Myrick met regularly with key GOP leaders to discuss legislation and to express the resolve of fiscal conservatives in her first term.17 “I think she has done a good job,” noted fellow freshman Republican Linda Smith of Washington of Myrick’s ability to communicate with GOP leadership in 1995. “Sue’s a lot more cautious than I am. I probably would have killed leadership a few times this year.”18 During her House career, Myrick chaired the Republican Study Committee, a group of several dozen of the chamber’s most conservative Members. She also worked for the Republican Conference’s Communications Working Group. In 2010, Myrick also joined the conservative Tea Party Caucus. Representative Myrick was attentive to the needs of her North Carolina district. In an effort to reduce unemployment in the ailing North Carolina textile industry, she threatened to block President George W. Bush from fast-tracking trade agreements until his administration pledged to protect domestic textile manufactures. Myrick’s hometown of Charlotte housed the headquarters for major financial institutions. Though she was initially among 25 Republicans who voted against a $700 billion rescue plan for ailing U.S. banks, she switched her vote when a second version came to the floor. She claimed conversations with her constituents, who could not get credit, convinced her to change her vote. “I talked to people I trust,” she noted, “good solid businesses. They could not get credit.”27 Spurred by the disappearance of an 18-year-old college student in North Carolina, Myrick passed legislation to create a national clearinghouse for information on missing adults.28 Her social agenda also reflected her constituents’ support for prayer in public schools and opposition to abortion measures. 1Keith Bradsher, “. . . And One Who Tries to Work Things Out,” 31 October 1995, New York Times: A22. 2Myrick also had three brothers, whose names are not available in published sources. See, Almanac of American Politics, 2010 (Washington, D.C.: National Journal Inc., 2009): 759. 3“Impeachment's Toll,” National Journal's House Race Hotline, 12 January 1999; “Under the Dome,” 9 April 2002, Raleigh News & Observer. Daniel Forest won election as North Carolina's lieutenant governor in 2012. See, for example, Jim Morrill, “Political Education Continues for Lt. Gov.-Elect Dan Forest,” 21 November 2012, Charlotte Observer. 4One stepdaughter is Mia (Myrick) Alderman. Myrick's other stepchildren's names are not available in published sources. See, Jim Morrill, “Myrick Spends Most on Family Business,” 23 March 2012, Charlotte Observer. 5Politics in America, 2012 (Washington, D.C.: Congressional Quarterly Inc., 2011): 737. 6“Candidate Q&A: 9th Congressional District,”3 November 2002, Charlotte Observer: 6R. 7Edsall, Thomas B. and Maralee Schwartz, “Clinton, Bush Add 3 More Win Columns,” 6 May 1992, Washington Post: A13; “North Carolina: 'Senator Sue in '92,'” 3 October 1991, The Hotline; “Washington and the World; Election '92,” 26 April 1992, Washington Times: A4; “Ex-N.C. Official Edges Myrick in Senate Race,” 6 May 1992, USA Today: 4A. For results of the primary, see “NC Senate: Faircloth Wins Bid to Face Sanford,” 6 May 1992, The Hotline. 8“North Carolina: Close Races Expected in Both the 2nd & 5th,” 2 May 1994, The Hotline; Tim Curran and Karen Foerstel, “Mann and Myers Top Endangered in Tuesday Races Ohio, N.C., Indiana Head to Polls,” 2 May 1994, Roll Call. 9“North Carolina: GOP Runoff in the 9th,” 4 May 1994, The Hotline. 10Tim Curran, “N.C. : Blamer Dogged By Resume Inflation in GOP Runoff,” 16 May 1994, Roll Call; Curran “N.C. : Myrick-Balmer Runoff Still Close for Open 9th Seat,” 26 May 1994, Roll Call. 11“Former Charlotte Mayor Wins Runoff Election for Congressional Seat,”1 June 1994, The Associated Press; Tim Curran, “Myrick Wins N.C. Runoff,”2 June 1994, Roll Call. 12“Election Statistics,” Office of the Historian, http://history.house.gov/Institution/Election-Statistics/Election-Statistics/. 13Ellen J. Silberman, “Burr, Myrick Get Committee Plums, Coble, Ballenger Subcommittee Chairs,” 8 December 1994, State News Service. 14Tim Funk, “Inside Your Washington,” 31 January 2005, Charlotte Observer: 2B; Myrick was also assigned to the First Select Bipartisan Committee to Investigate the Preparation For and Response to Hurricane Katrina, which convened from September 21, 2005 to February 15, 2006. For committee information, see Garrison Nelson and Charles Stewart, III, Committees in the U.S. Congress, 1993-2010 (Washington, D.C.: Congressional Quarterly Press, 2011): 866; Congressional Directory, various editions; Office of the Historian, “Women Members' Committee Assignments (Standing, Joint, Select) in the U.S. House, 1917-Present,” http://history.house.gov/Exhibitions-and-Publications/WIC/Historical-Data/Women-Committee-Assignments/; Office of the Historian, “Women Who Have Chaired Subcommittees of Standing Committees in the U.S. House, 1947-Present,” http://history.house.gov/Exhibitions-and-Publications/WIC/Historical-Data/Women-Chairs-of-Subcommittees/. 15Kenneth J. Cooper, “House Freshmen Couldn't Wait to Get Down to Business,” 8 January 1995, Washington Post: 8. 16Sheryl Gay Solberg, "Shrink Government, the Right Tells the Right," 4 January 2004, New York Times: WK1. 17Almanac of American Politics, 2012 (Washington, D.C.: National Journal Inc., 2011): 1228. 19David S. Broder, “Rebels,” 31 December 1995, Washington Post: L10. 20Jackie Koszczuk, “Frustration Sparks Rebellion, Discontent Fuels Smoldering Fire,” 36 July 1997, CQ Weekly: 1752-1753. 21Politics in America, 2004 (Washington, D.C.: Congressional Quarterly Inc., 2003): 761; John E. Yang, “Gingrich Gets Boost Despite GOP Intrigue,” 17 July 1997, Washington Post: A1. 22“For New Republican Leaders, Watchword is Realism Not Revolution.” In CQ Almanac 1998, 54th ed. 7-7-7-12. Washington, D.C.: Congressional Quarterly, 1999. http://library.cqpress.com/cqalmanac/cqal98-0000191046 (accessed 16 April 2013). 23Politics in America, 2004: 761. 25Franco Ordonez, “Controversy and Constituent Service Marked Sue Myrick's 9 Terms in Congress,” 29 December 2012, Charlotte Observer. 26Politics in America, 2012: 736. 27“Congress Clears $700 Billion Bailout Of Financial Services Industry.” In CQ Almanac 2012, 64th ed., 7-3-7-6. Washington, D.C.: Congressional Quarterly, 2009. http://library.cqpress.com/cqalmanac/cqal08-1090-52026-2174903 (accessed 16 April 2013). 28Congresswoman Sue Myrick: Press Releases, “Kristen's Act Passes in House,” http://myrick.house.gov (accessed 3 October 2012; site discontinued). 29Politics in America, 2012: 736. 30John Wagner, “Sue Myrick - Party Shaper,” 31 July 2000, Raleigh News & Observer: A1. 31Politics in America, 2012: 736. 32Congressional Record, House 106th Cong., 2nd sess. (30 March 2002): 1624; Politics in America, 2004: 761; Politics in America, 2012: 736. 33Almanac of American Politics, 2012: 1128. 34Rachel Weiner, “N.C. Republican Rep. Sue Myrick Retiring,” 7 February 2012, Washington Post; Ordonez, “Controversy and Constituent Service Marked Sue Myrick's 9 Terms in Congress;” Rebecca Baird-Rembs, “Take Five With Rep. Sue Myrick,” 3 December 2012, Roll Call. Papers: 1987-1991, 5 linear feet. The papers of Sue Myrick document two mayoral terms (1987-1991) of the first female mayor of Charlotte, N.C. The collection contains no records concerning her city council tenure (1983-85), her campaigns for the U.S. Senate (1992) and the U.S. House of Representative (1994), or her professional career as an advertising executive. Videoreels: 1996, 7 commercials on 4 videoreels. The commercials were used during Sue Myrick's 1996 campaign for U.S. Congress in District 9 of North Carolina, Republican Party. "Sue Myrick" In Profiles in Character: The Values that Made America. Nashville: Thomas Nelson Publishers, 1996. "Sue Myrick" in Women in Congress, 1917-2006. Prepared under the direction of the Committee on House Administration by the Office of History & Preservation, U. S. House of Representatives. Washington: Government Printing Office, 2006. The Honorable Sue Myrick remembers interacting with leadership as a freshman. The Honorable Sue Myrick remembers speaking out about her experience with breast cancer and the effect it had on her female constituents.